While Lithuania continues to make improvements to its investment climate, policy solutions are still needed to make it more attractive to foreign companies willing to invest and create jobs in the country. 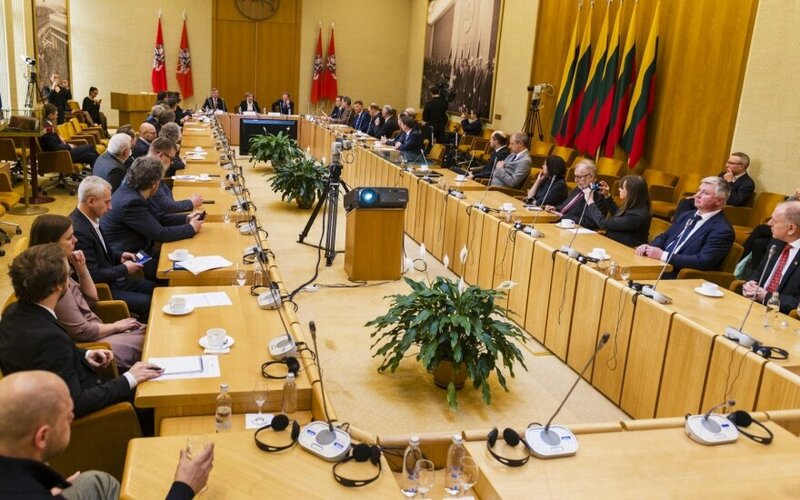 A discussion hosted at the Lithuanian parliament brought together Lithuanian policymakers, Nordic investors and business associations to talk about FDI, taxes and what it would take for Lithuania to move closer to its Northern European neighbours. "When Norwegian business started to establish companies here, in Lithuania, decades years ago, they sought out the lower labour cost. Now, Norwegian enterprises seek to create the value-added business with innovative and reliable partners from Lithuania," noted Karsten Klepsvik, the Ambassador of Norway to Lithuania, opening the discussion. Today, over 300 Norwegian companies operate in Lithuania, almost as many as in neighbouring Poland, a country ten times the size: "This tells you something about the size of Norway's presence in Lithuania," according to Ambassador Klepsvik. The Nordics – Norway alongside Sweden, Denmark, Finland and Iceland – account for by far the biggest foreign direct investment portfolio in Lithuania, attesting to the country's successful efforts to create a favourable climate for foreign companies to come and create new jobs. Lithuania has made some significant steps in that direction over the last several years, pointed out Laurynas Suodaitis of Invest Lithuania, the government agency charged with attracting and assisting foreign investors. A recently adopted new Labour Code has liberalized the country's labour relations, pushing Lithuania up Doing Business rankings and the Global Competitiveness index; simplified regulations have cut the time needed to conclude environmental impact assessment procedures by 40%; and improvements in infrastructure allow connecting new facilities to electricity and gas grids quicker than ever before. Jan Hyttel, Danish board member of the logistics company "Hoptrans", shared his experience of having lived and worked in Lithuania for a quarter-century. "Over these last 25 years, Lithuania moved from a closed to an open country, with its own identity, industry and political system. In the next 25 years, we hope that Lithuania will focus on education, will streamline, coordinate, listen, learn and use [Nordic experience]," Mr Hyttul said. Building and keeping strong industrial sector in the country was another piece of advice offered by Mr Jan Hyttel, who said he would also welcome a certain change in mentality, to one more welcoming towards foreign investors. "We are not here to steal your country," he said. Stein Ove Sektnan, of the Norwegian-Lithuanian Chamber of Commerce, believed that Lithuania could look into adopting Norwegian IT solutions for public services, e.g., healthcare. Norway, in turn, could make use of Lithuania's EU membership and build processing plants for its fish here to avoid EU import duties. Rolandas Valiūnas, board chairman of Investors' Forum, pointed out what drawbacks investors represented by his organization still see in Lithuania. 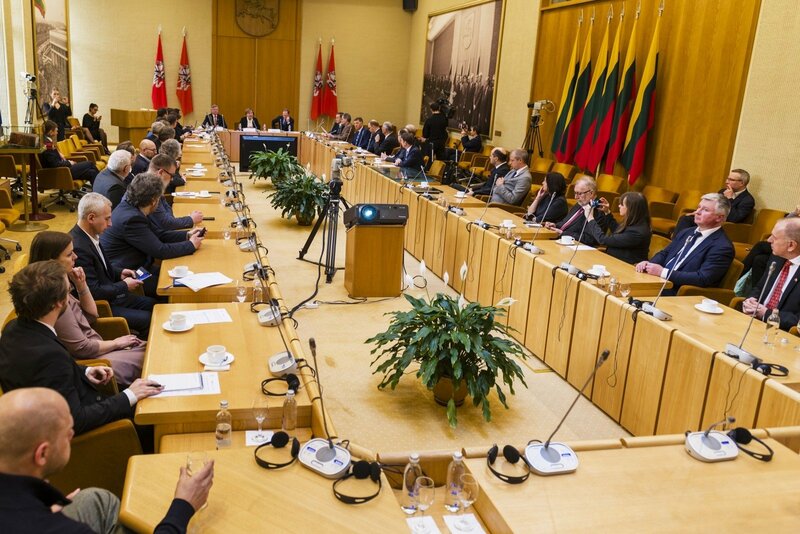 High labour taxation was one, he said, while Lithuania's shrinking labour force, drained by migration, threaten to impede economic growth in the future. Even though Lithuania is among the lowest-taxed countries in the EU, levies on labour are something that dampens the country's attractiveness for investors. Discussion participants singled out, in particular, social insurance contributions; while capping them for high-earners might attract more high-paying jobs, proposals to that effect have so far failed to make their way in the legislature. Speaking on behalf of the ruling Lithuanian Farmers and Greens Union, MP Rūta Miliūtė said tax reforms were in the works. Shortage of labour force, exacerbated by Lithuania's rigid immigration policies, was another sore point mentioned by discussion participants. 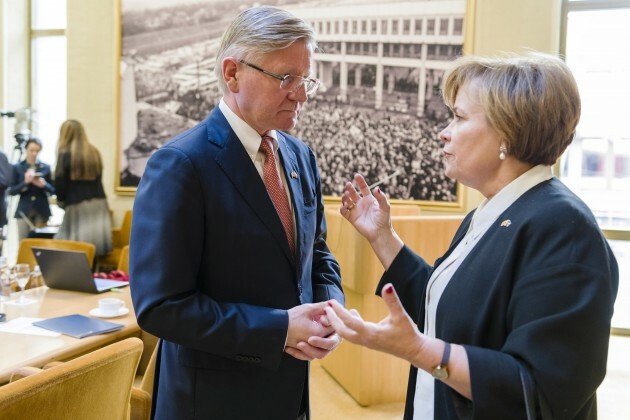 In order to sustain its economic growth aspirations, Lithuania must think about importing the skills its economy needs from abroad, Mr Valiūnas, among others, noted. Neighbouring Belarus and Ukraine represent potential talent pools that Lithuania could draw from, especially for sectors like IT. While policymakers generally agreed that Lithuania's Migration Department needed an overhaul in order to be able to process applications more efficiently, conservative MP Rasa Juknevičienė said that the need for skills should be weighed against security concerns. Former conservative Prime Minister and now Opposition Leader Andrius Kubilius warned of the "middle-income trap" faced by Lithuania: no longer able to attract foreign capital with cheap labour, the country still needs investment to keep developing its economy. The decade to come may be one of slower growth. As a way out of the trap, he quoted the Irish example of "modernization by invitation". "It is time for us in Lithuania to have a clear understanding how important it is to bring much more investment, especially to the high-tech sector which can bring the productivity of our economy up," according to Mr Kubilius. The discussion was organised by the Group for Inter-Parliamentary Relations with North European Countries, the Norwegian-Lithuanian Chamber of Commerce and the Royal Norwegian Embassy in Lithuania, in partnership with the Swedish Chamber of Commerce in Lithuania, the Danish Chamber of Commerce in Lithuania, the Finnish-Lithuanian Chamber of Commerce and Investors' Forum.